Email excellence is a moving target. Improve your aim and stay on top of the trends. 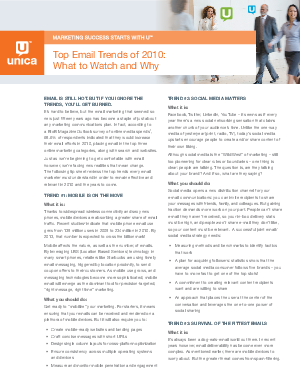 Download Top Email Trends of 2010 to find out what you should watch for and why, and to review the top trends every email marketer must understand in order to remain effective and relevant in the years to come. Learn how to optimize email delivery rates, ensure message integrity and readability, and to protect your online reputation in a rapidly evolving and complex email marketing landscape. Download now!